Nicole Martin was only eight years old when the vampire slaves rose up in rebellion and killed her family. Now she devotes her life to finding a vaccine against vampirism, hoping to wipe out her memories -- along with every bloodsucker on the planet. But there's one thing she cannot destroy: her searing, undeniable attraction for the one man she should hate and fear the most . 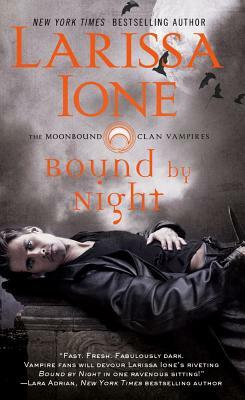 . .
A member of the renegade vampire MoonBound Clan, Riker is haunted by demons of his own. When he recognizes Nicole and remembers how her family enslaved his loved ones, his heart burns for vengeance. But when he kidnaps Nicole and holds her in a secret lair, his mortal enemy becomes his soul obsession, his greatest temptation, and, perhaps, his only salvation -- a hot-blooded lover who could heal him with her touch . . . or bury him forever.